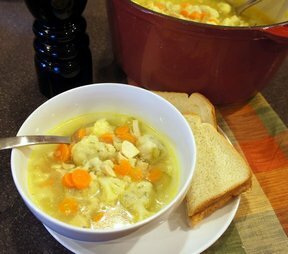 A comforting soup that is simple to make. The dumplings are like homemade noodles but without all the fuss of rolling them out. Perfect served when its cold outside. Place chicken and water in a large pot over high heat and bring to a boil. Reduce heat, cover and simmer, skimming fat as needed. Chicken is cooked when skin begins to curl. Add onions, celery, carrots, potatoes and soup base to broth and bring to a boil. Add chicken and cook until vegetables are tender. Salt and pepper to taste. For dumplings, beat egg. Add remaining ingredients. Mix and drop by teaspoons into broth. Bring soup to a light boil. Soup must be boiling to cook dumplings properly. Cook about 15-20 minutes. 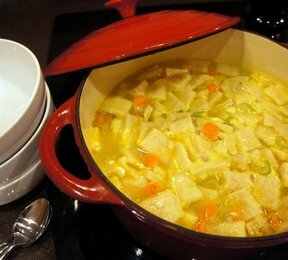 "I was home from work because of a snow storm and I found this recipe. I just had to try it because I love dumplings and it was a perfect day to make soup. It was delicious! 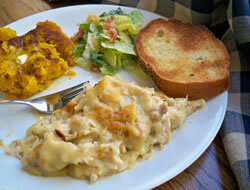 It was a great treat on a snowy day." "This makes alot of dumplings. I think the water instead of milk in the dumplings helps them keep their shape instead of melting into the soup. 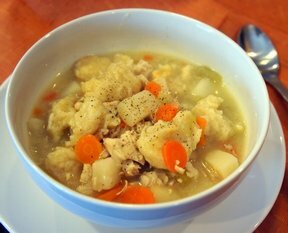 Great soup for a snowy day."